There’s a lot of pressure when it comes to social media and your business. First, social media never sleeps. 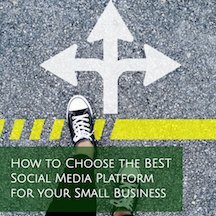 Then, each social platform has different rules you need to follow in order to be successful. Next, the social space is a noisy one, and small business owners don’t have much time to focus on breaking through that noise in order to stand out. Also, there’s the pressure to be reallllllly good at social. You’ve gotta get big numbers, big views, and big popularity, right? Let’s toss in Facebook’s constantly-declining organic Reach, just for fun. And if you only have a few hundred follows or Likes or whatnot, that must mean you aren’t making social media work for you. Here at Eli Rose, we very much believe that being realistic and reasonable is essential to your small business and online marketing success. We coach all our clients that less is more and that you are better off doing a couple things very well instead of only doing the bare minimum at 4 or 5 or 6 things. We know that Facebook is where everyone is *supposed to be*. It’s the social media behemoth, after all. But we also know that there are plenty of businesses who want to have an active Facebook presence while having absolutely no expectations or desired measurable ROI for their Facebook Business Page. Here are 2 great reasons why you can have no expectations for your Facebook Business Page and not feel bad about it. When your main lead generation source is something other than Facebook If you have more than 1 social media profile for your business, can you honestly say that both or all of them are equally effective in driving new leads? I have clients who get most of their leads from LinkedIn, for example, who simply want a Facebook Page with a presence that has current activity (think: 2-3 posts per week) and accurate, complete information on their Facebook Page. They aren’t looking for big Page growth numbers. They don’t worry about post engagement. They aren’t seeking the latest viral video making the rounds on Facebook. They just want a solidly-built Facebook Page with current activity in case a customer or potential customer looks for them on Facebook. When your goal for Facebook (or any social media platform) is simply to be present. I have clients who tell me that they know their clients spend time on Facebook (even if a B2B business). They don’t want potential clients who are making decisions on what vendor to select, to decide against their company because they’ve never heard of them before. Basically, they don’t want to *not* be on the most used social media platform because they know this could portray them in a bad light. Most consumers assume that not only does a business have a website, they also have a Facebook Page. So what message does it send when your business is not on Facebook? So if your business doesn’t rely on Facebook for new business leads, don’t fret! 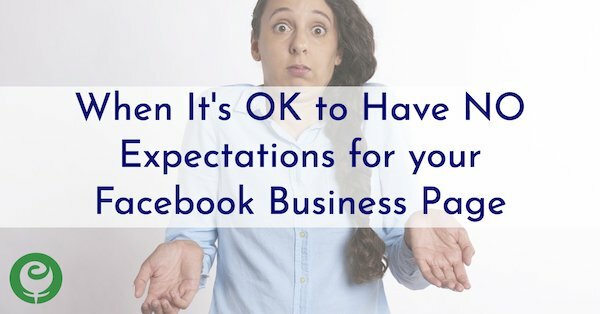 You aren’t alone and it’s totally OK to have different goals and expectations for your Facebook Page than you do for another online marketing tactic.